At Ripon Sailing Club we offer you a quick, easy and safe way to learn to sail or learn powerboat handling skills. We provide a range of courses to help our members progress and make the most of their time afloat, whatever their age, ability or aspirations. We are a recognised Royal Yachting Association (RYA) Training Establishment and the courses are taught by fully qualified RYA instructors. Our instructors are all club members, volunteers who love teaching sailing or powerboating. This also helps keep our costs down which means we offer some of the best value training available. To take part in any of our courses you do need to be a member of Ripon Sailing Club, and where the participant is aged 16 or under we insist on a parent or guardian remaining on site throughout the day. Details about membership can be found on the "Our Club" page of this website under the " Thinking of Joining" tab. We offer "Taster sails" for non members. Details of these can be found on the "Our Club" website page too. We run various approved RYA certificated courses and supplementary coaching sessions, primarily to teach new members how to sail, and then to develop skills and confidence. We want to help adults and children to enjoy what can become a lifelong interest. Children from 7 years and upwards can join our courses. Once you are a member of Ripon Sailing Club, you will be given a members login for the website and you can book any of our courses online by following the links from the Book Online tab. Course fees are around £35/day for juniors and £40/day for adults. 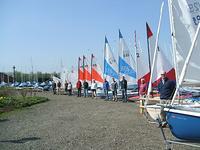 Use of the club dinghies, buoyancy aids and helmets is included in the course fee. To find the dates of our courses, please look at the calendar on this website. Once you have achieved your first qualifications, the club runs further Adult and Junior Improver's coaching sessions on many Saturdays from April to October, you can book on line and can book one of our club boats if you do not have your own. These Improver sessions are a good way refreshing your sailing skills if you have not sailed for some time. In a sailing club like ours, the main activity is dinghy racing. Racing is the most popular way of "giving a purpose" to your sailing activities whilst at the same time improving your skills and sharpening your techniques by competition. Once sailors have completed their initial training, we offer Race Training sessions. Look on the calendar to see when the sessions are running and book to come along - you will develop your skills but make new friends too! Additional dates may be added depending on demand, or we can run any course for a minimum of 4 people over 2 or 3 days (sailing) subject to the availability of our volunteer instructors and club dinghies. Contact the training team to discuss options, and make a booking via our on-line booking system. Please note that due to the amount of work involved in planning the courses we do not refund cancellations made within 2 weeks of the date of the course unless we are able to fill the places. We provide RYA Powerboat Level 2 (PB2) training over 2 days to adults and children over 12 years. This course assumes no previous knowledge or experience. For juniors aged 8 - 11 we provide a 1 day RYA Powerboat level 1 (PB1) course. If you can already operate a powerboat, we have 'Safety Boat Familiarisation' sessions usually on the first Thursday evening of the month to show you how to launch and recover the powerboats. Additional dates may be added depending on demand, or we can run any course for a minimum of 2 people over 2 days (Powerboat level 2), subject to the availability of our volunteer instructors.